Have you ever wondered to yourself where the iPhone deleted items end up? Deleted photos from the photo library immediately find their way to the “recently deleted” folder, but what about songs, apps, videos, etc. Do they fly off the phone into the air? Surely, the answer is no. They only go away from sight but remain on the storage disk of the iPhone. So, have you been deleting data effectively from your iPhone? A file is not effectively deleted if it is still recoverable by recovery tools. With iMyFone Umate Pro or iMyFone Umate Pro for Mac, a super cleaning app that functions off the computer, you can scan and see these files for yourself. Step 1: Download and run iMyFone Umate Pro on your PC. Step 2: Just click on the “Erase Deleted Files” feature and scan for deleted data. Maybe after the scan you can answer the question, “have you been deleting data effectively from your phone?” People get hacked by different means including through recoverable files. Deleted files don’t really go away on smartphones. With god recovery programs, they will resurface. If there is ever any data you want destroyed beyond recovery for good for privacy reasons, the Umate Pro iPhone Data Eraser got your back. Virtually any bit of information can be deleted permanently using the Umate Pro iPhone Data Eraser, including message, contacts, call histories, third party apps, just anything. For erasing iPhone deleted records, just continue with the “Erase Deleted Files”, all you need to do is to preview the files, select and click on the “Erase Now” button. 1-	Click Free Up Space – This will help you get rid of hidden junk and temporary files that hang all around your phone and keep it functioning at its best. Erase All Data - This allows a user to wipe out every data on their iPhones without disrupting the phone settings. 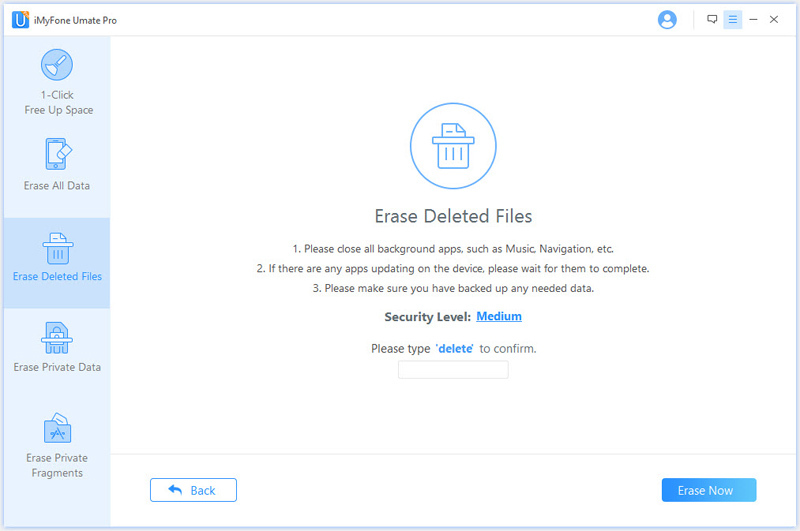 Erase Deleted Files – This will let you scan for the hidden deleted data, and allow you erase them permanently. 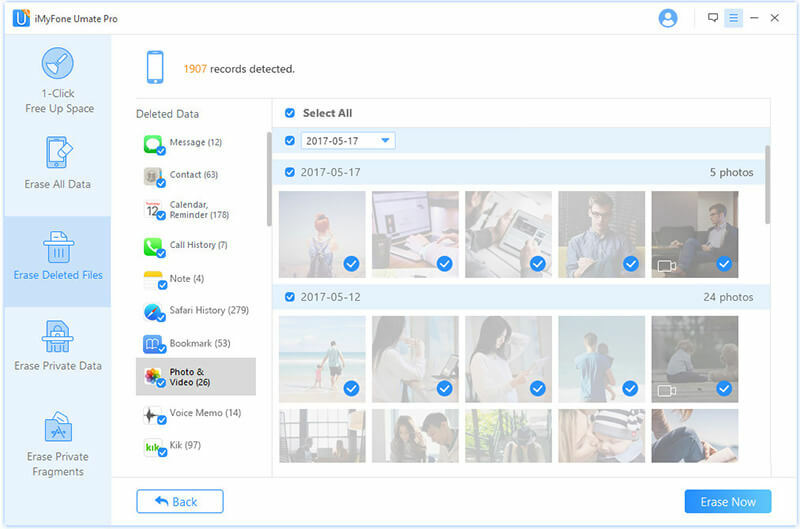 Erase Private Data – This allow you to identify these sensitive messages, contacts, photos, videos, histories etc, and erase iOS data. Erase Private Fragments - Like the buffer memory of PCs, there are pieces of data that never stop running even if you try to stop them. This feature affords a user an effortless way out to erasing third-party Apps. Have you ever tried to delete an email from the default mail client? It is a tricky sea to navigate since there’s no delete option on the page. So, here’s how to go about it: select the mails you want out, then move them to the junk folder. Navigate towards the junk folder, swipe left on the mail and there you’ll find the delete button. This doesn’t guarantee the mail is gone beyond recovery. So, get on the Umate Pro app and click on the “1 click free up space” feature delete the junk files and temp files to be sure. If you were unaware of the “recently deleted” folder, then chances are people have probably seen the photos you don’t want them to see. However, we are here to help you out. Plug your iPhone to your PC and launch the Umate Pro App. Click on the “erase deleted files” feature select photos and delete them like you should. How to Erase Stolen iPhone Data? How to Delete Google Search History on iPhone iOS 12/11/10?